Cam Levins took down Jerome Drayton's long-standing Canadian marathon record earlier this month in Toronto during his debut at the distance. The Black Creek, British Columbia native, who now resides in the United States and represents Hoka ONE ONE, threw down a 2:09.25 at the Waterfront Marathon to eclipse Drayton's mark of 2:10.09, which was set way back in 1975 in Fukuoka, Japan. Prior to his recent focus on the marathon, Levins was a 5,000m and 10,000m specialist who competed at the 2012 London Olympic Games. His career achievements include collecting a bronze medal in the 10,000 at the 2014 Commonwealth Games, as well as a trio of Canadian XC Championships (2010 to 2012), among many others. Levins, who represented Southern Utah during his college days, owns a number of world class pr's that include: 3:54.74 - indoor mile, 13:15.19 - 5,000m and 27:07.51 - 10,000m. MileSplit caught up with Cam to gain more insight on his record setting run and to learn about what's next in his athletic career. Firstly, what does it mean to you to have overtaken Jerome Drayton's long-standing national marathon record? Taking Jerome's record would have been an achievement I'd appreciate at any point in my career. However, it's especially important to me now, because it feels like a resurgence of my career and a sign that I can compete well in this sport again. With the temperature reaching as low as -2 degrees Celsius during your race combined with high winds in parts, to many observers it didn't appear to be a recipe that would lead to a record setting day. Talk about how you executed your plan and how you overcame the adverse weather conditions to get the job done. There was a certain amount of naivety on my part. Since I hadn't ran one before, I was simply following the pacers and seeing where that put me. I had two fantastic pacers who helped make sure I stayed on track and did a great job bringing me back to our pack when a gap developed at the bottle stations. It probably wasn't ideal weather conditions, but I felt great and executed my race plan well. 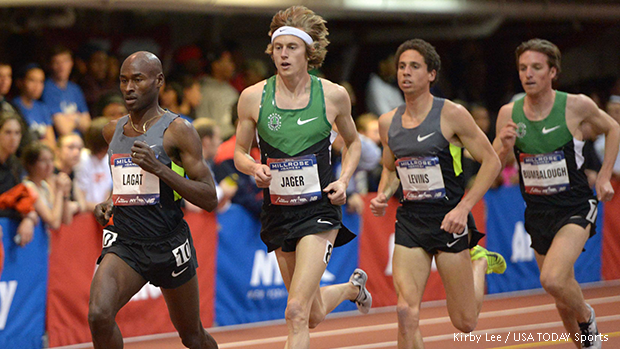 Cam Levins shown competing at the 2014 USATF High Performance Distance Classic. Did you encounter any tough patches throughout your run? Aside from weather, what adversity did you face during the race? Mostly I felt that I spent much of the race holding back until I pushed the last 10-12 km; that may be in part because I didn't know how the marathon was supposed to feel. Until the last 8 km I felt smooth, and even when I was tired I had strength from which to pull. I did find some surges in pace a little uncomfortable to cover, but they didn't really wear me out ultimately. Can you give us a snapshot of a typical week of training or perhaps a difficult week of training in your lead-up to Toronto Waterfront. I do long runs every 10-12 days, and those are typically at a steady pace with a faster finish. I like to aim for at least 3 workouts per week, and 2-3 runs most days. I wouldn't say there's enough consistency in what sessions are included in a typical week. However, most workouts were based around marathon and half marathon pace. I would like to include some more based around 5-10 km pace for speed in the future. You are widely known to have put in huge mileage weeks earlier in your career. Do you think the endurance foundation that you built factored heavily into your immediate success at the marathon distance? There are so many factors to being a successful athlete. Ultimately, I believe the mileage helped my legs feel more fresh and less thrashed late in the race. I ran lots in my preparation for this marathon along with how much I've done over my career, and so I don't know which was more important. However, more mileage isn't always the key for everyone, as there are successful marathoners who run fewer miles per week than me. Do you have aspirations to lower your new Canadian standard? If so, how low do you think you can take it in the future? I think it's reasonable to expect I can lower my time from a debut. There is a lot I could have done better in my lead-up to this marathon, and I believe experience can have an especially strong effect on marathon results. I don't like setting limits in any event, so I won't speak to what I may end up running at my best, but I hope to make the Canadian national record competitive with other top countries. 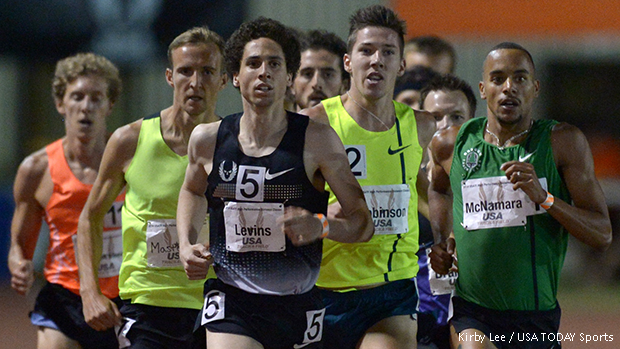 Cam Levins is focused on the marathon for now, but he doesn't rule out a return to the track. In terms of your future competition goals, is it all about the marathon for you or do you ever foresee yourself going back to the track for 5,000m / 10,000m races or heading to the road-racing circuit for shorter distance contests? I'm excited about training and racing the marathon at the moment, but I can definitely see myself on the track again at some point. However, in the mean time, I plan to contest shorter road races during future marathon lead-ups.